The infamous ‘Oil Change’, or by its less known name ‘The Most Uninteresting Way To Spend An Afternoon’ is like a haircut, something you do a few times per year but without the self-image boost. If you do it consistently nobody even really notices if you forget it, EVERYONE KNOWS. You see an Oil Change doesn’t add an extra 20 HP or make your car glide down the road like a Ferrari. However, what it does do is keep your car running. Yep, that’s fairly important. The simplest explanation is your car’s engine runs by a series of mini explosions within the engine to create power. To make this happen you have hundreds of small parts that work together in an extremely hot engine. The oil in your engine is the lubrication between all of that friction to keep your engine running smooth. If you wait too long to change your oil or just forget, your oil breaks down and turns into sludge, which could cause your engine to cease up, the only solution to that is to rebuild your engine or go buy another car. It seems like a mundane basic service, however, it’s the most important service you can do to keep your vehicle on the road. In a nutshell, Synthetic Oil is better for your vehicle. It lasts longer, runs cleaner and helps get more out of your engine. Which also means it’s more expensive, but it’s well worth the extra investment. We highly recommend you never go from Synthetic Oil back to Conventional Oil just to save money. On the other hand, Conventional Oil has worked great for decades. If your vehicle has conventional oil, and that is what is suggested by the dealer, we suggest you continue using it. It’s how your car was designed. There are some rare cases we may suggest a change but that is on a case by case basis. What is the deal with the Oil Filter? The Oil Filter is there to clean the oil and make it last as long as possible, once you hit that 3,000-5,000 miles or 7,000 for some synthetic oils it needs to be replaced. You should always replace the oil filter during the service to get the best performance out of the new oil. 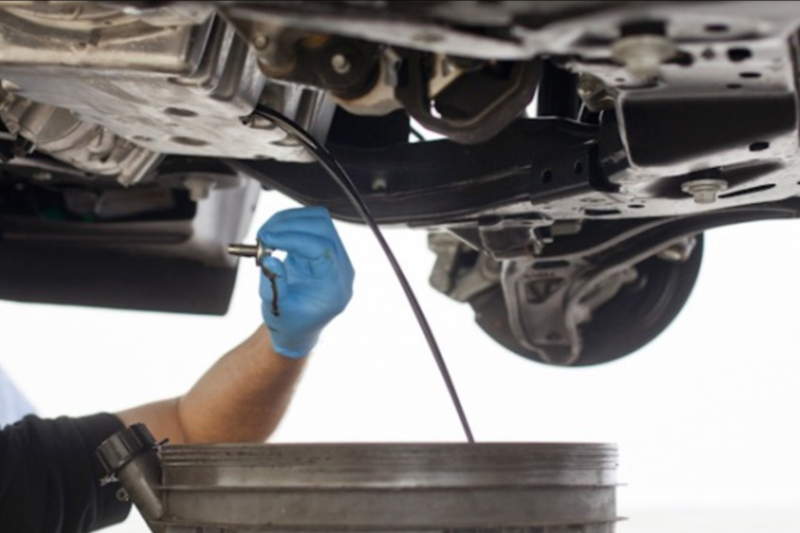 Our full-service oil change includes an oil and filter change, we check and adjust tire pressure and top off fluids. We check your air filter, cabin air filter if your car has one, belts, hoses, wiper blades and all your lights. We will inform you of any potentially critical issues and if you are interested in letting us fix any deficiencies we will be happy to do so. But more than anything, we just want you to be more informed about your car. Cooling system flushes and transmission flushes are also something we are able to do, when it gets hot and your A/C needs servicing we can help you with that as well.